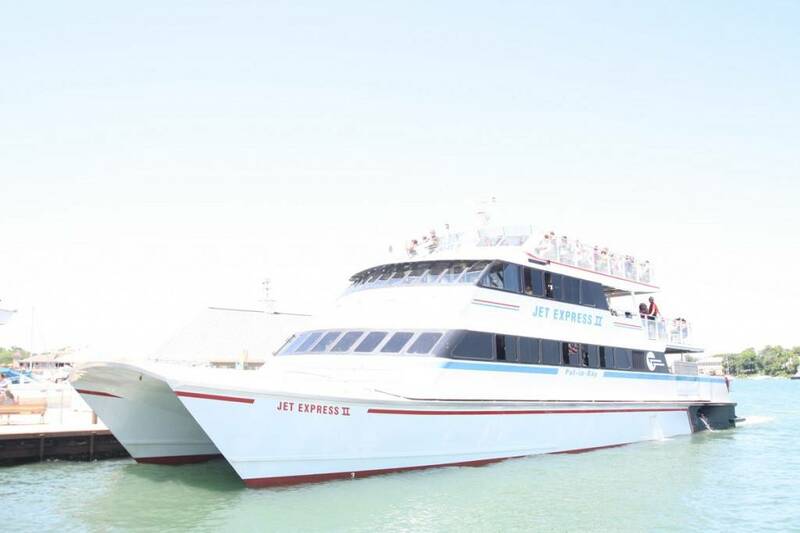 Why choose the Jet Express for Ferry Service? The Jet Express offers passengers a stylish and interesting way to come to Put-in-Bay. Their dual hulled catamaran slices through Lake Erie with ease. Along the way, passengers get to see nearly all of the Lake Erie Islands. There are even Canadian islands to be seen along the way. Also, there are multiple seating options. Guests can ride in air conditioned comfort in the main cabin. Otherwise, the more adventurous types can enjoy the upper deck. Here, the expansive views and open air are sure to delight. So, for style and comfort, the Jet Express is an easy choice. Lastly, their late service is very convenient. Visitors not wishing to stay on the island can still get a taste of the legendary nightlife. Get more bang for your vacation dollar when you ride the Jet-Express from Sandusky Ohio or Port Clinton Ohio. With every paid ticket, Jet-Express passengers receive a value packed coupon sheet. This contains savings at many of the best Put-in-Bay Things to Do, Dining and Shopping options. Discounts include $5.00 of golf carts and mopeds, Kids Eat Free in many restaurants, discounts on attractions, and much more! So, be sure to request your money saving coupons when you purchase your Jet Express ticket. Also, you may now purchase tickets on-line! Simply visit the Jet Express website and place your order today!